Oxford SA Blog | Come and play! Home Uncategorized Come and play! The first South African interactive dictionary epub has just been launched by Oxford University Press South Africa. It’s part of a range of colourful picture dictionaries – the First Bilingual Dictionary range — covering all 11 South African official languages. The print editions have been available for some years, but this is the first time that any of the editions has been made available digitally, with enhancements that make learning fun. The dictionary is structured in an innovative way, with topic pages grouping vocabulary for a particular scenario, as well as a read-aloud story that brings everything together in an appealing narrative, complete with friendly characters. The digital edition includes audio clips for all the words in the dictionary (in both languages), giving learners a chance to hear how a word is pronounced before trying it out for themselves. Feeling confident about pronouncing a word can make the world of difference to how engaged learners are in class. The digital edition also includes the full text of the read-aloud stories – learners can listen to how words in their additional language sound when read slowly but fluently, while following the printed text. This supports good phonic development. There are also interactive activities, allowing learners to tap, type and say the words they’re learning. The activities mark themselves so learners get immediate feedback on their answers. Learning a language in the first few years of school need no longer be intimidating, with this playful and supportive dictionary at hand. 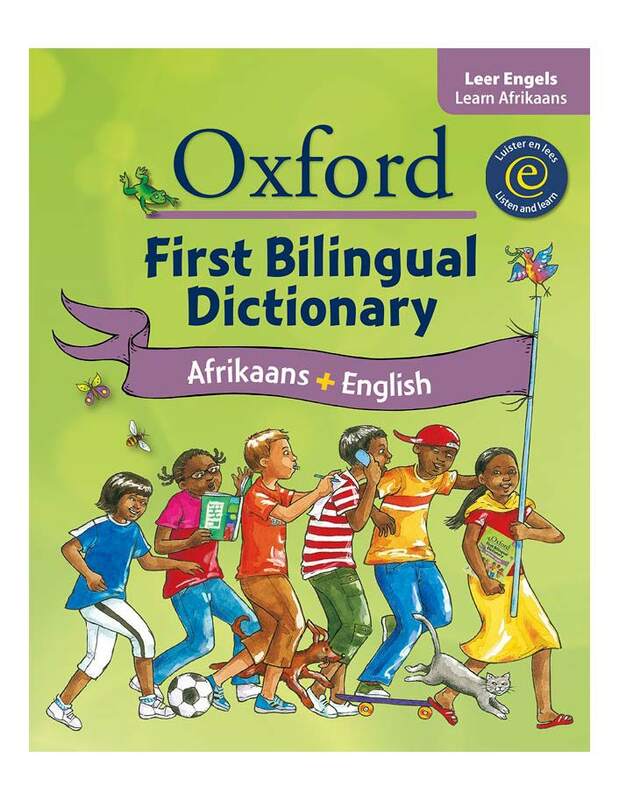 Currently available as a digital edition for Afrikaans and English as Oxford First Bilingual Dictionary: Afrikaans and English ISBN 978 0 19 040629 5. Print editions are available for all languages.